Figure 1. 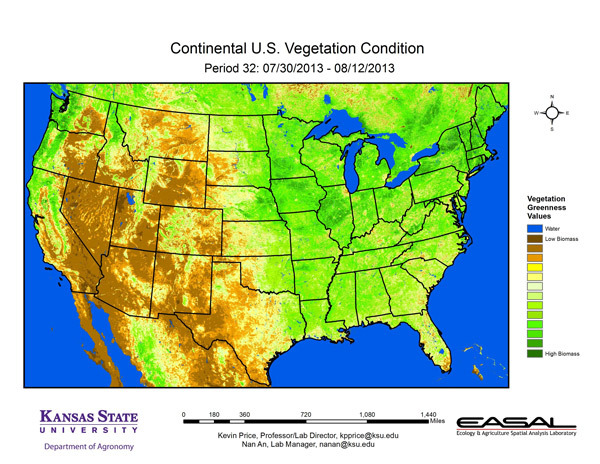 The Vegetation Condition Report for Kansas for July 30 – August 12 from K-State’s Ecology and Agriculture Spatial Analysis Laboratory shows that the greatest level of photosynthetic activity is in the northeast, where late-planted corn is in its highest growth phase. Increased activity is also evident in parts of northwest and southwest Kansas, where recent rains and cool weather have increased photosynthetic activity. Figure 2. 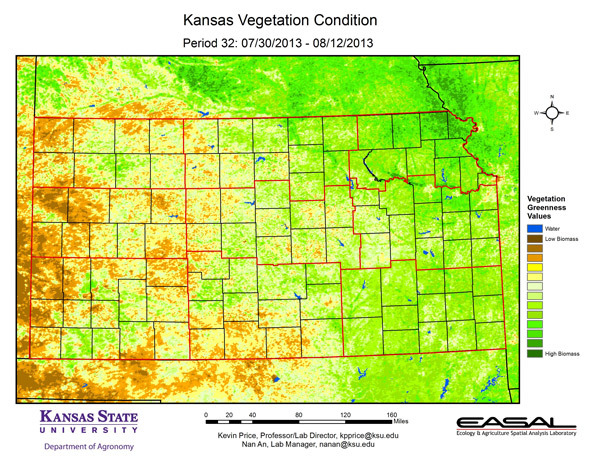 Compared to the previous year at this time for Kansas, the current Vegetation Condition Report for July 30 – August 12 from K-State’s Ecology and Agriculture Spatial Analysis Laboratory shows that most of the state has much higher biomass production. This is particularly noticeable in the Southeastern Division. Figure 3. 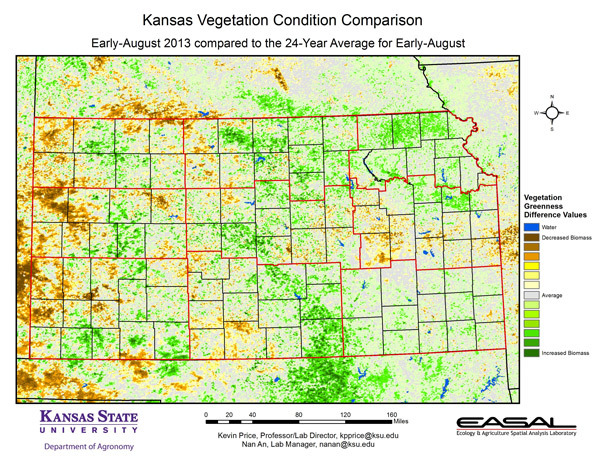 Compared to the 24-year average at this time for Kansas, this year’s Vegetation Condition Report for July 30 – August 12 from K-State’s Ecology and Agriculture Spatial Analysis Laboratory shows that much of the state has normal or above-normal biomass production. Counties in the western third of the state show the greatest decrease in activity. These are areas that continue to be in Exceptional Drought according to the U.S. Drought Monitor and have had the least amount of precipitation. In northwest Kansas, the August precipitation through August 12th is only 79 percent of normal. In contrast, the Southeastern Division is averaging 300 percent of normal for the same period. Also noteworthy is the area of east central Kansas (Chase, Morris, and western Lyon counties) where biomass production continues to be below average. This area is dominated by warm-season pastures, and was later in receiving moisture. Due to the cooler-than-average temperatures, these grasslands have been slower to recover from the extended drought. Figure 4. 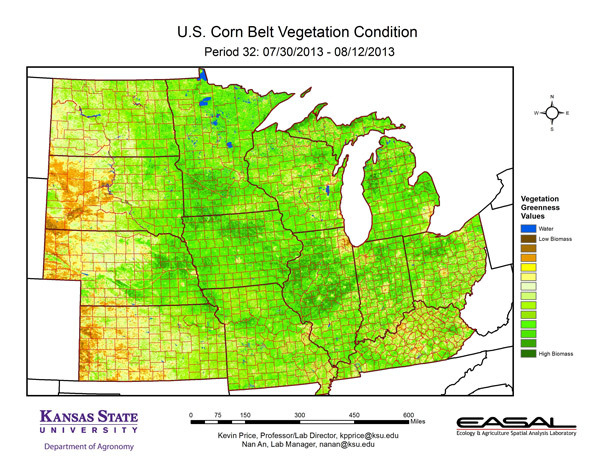 The Vegetation Condition Report for the Corn Belt for July 30 – August 12 from K-State’s Ecology and Agriculture Spatial Analysis Laboratory shows that the highest productivity is centered around Iowa. This region has a large amount of late-planted corn, which was in its most active developmental phase during this two-week composite period. In Iowa, only 42 percent of the corn has reached milk stage, compared to a 5-year average of 72 percent. Figure 5. 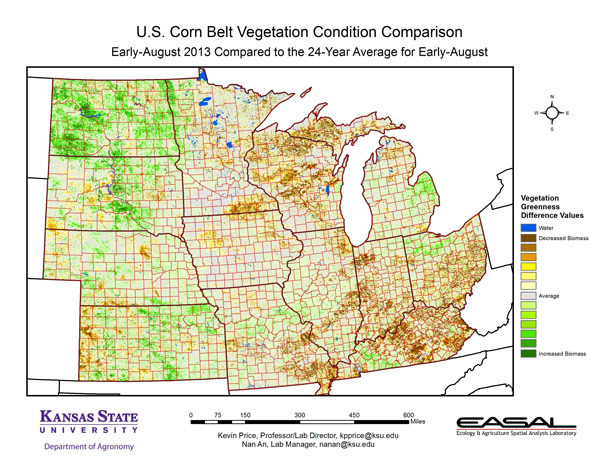 The comparison to last year in the Corn Belt for the period July 30 – August 12 from K-State’s Ecology and Agriculture Spatial Analysis Laboratory shows that Wisconsin is a center for lower biomass production, as are parts of Ohio and Kentucky. Excess moisture has played a role in these areas. In Kentucky, 23 percent of the topsoil is reporting surplus moisture. Figure 6. 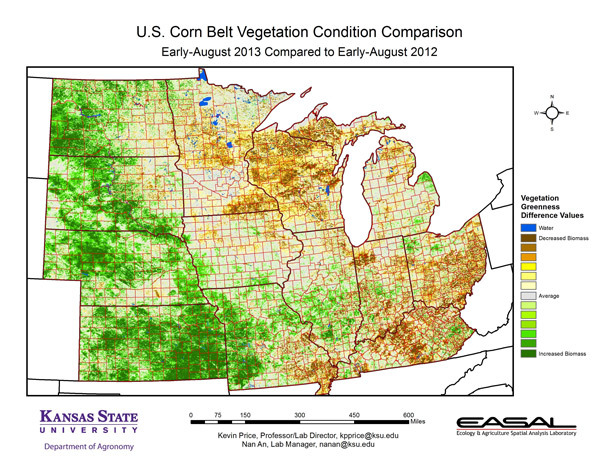 Compared to the 24-year average at this time for the Corn Belt, this year’s Vegetation Condition Report for July 30 – August 12 from K-State’s Ecology and Agriculture Spatial Analysis Laboratory shows the eastern portion of the Corn Belt has lower-than-average biomass production. Cooler-than-average temperatures in the Midwest and late spring planting have delayed development in the region. In Wisconsin, temperatures averaged between 2 and 6 degrees below normal. Figure 7. 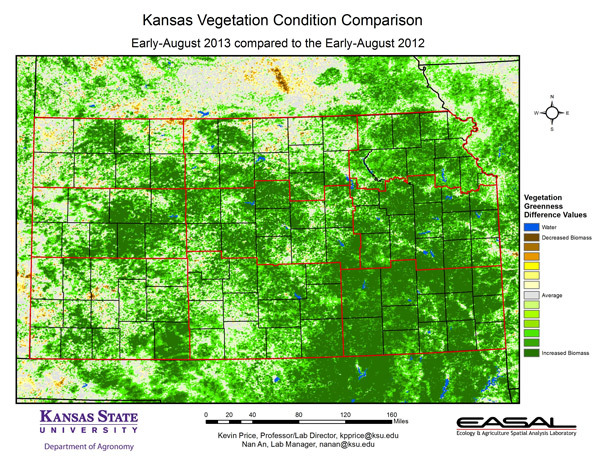 The Vegetation Condition Report for the U.S. for July 30 – August 12 from K-State’s Ecology and Agriculture Spatial Analysis Laboratory shows that highest biomass production is centered around Iowa and in upper New England. The Pacific Northwest and northern California are showing moderate rates of photosynthetic activity, while pockets of moderate activity can be seen in the desert Southwest where monsoon activity was greatest. Figure 8. 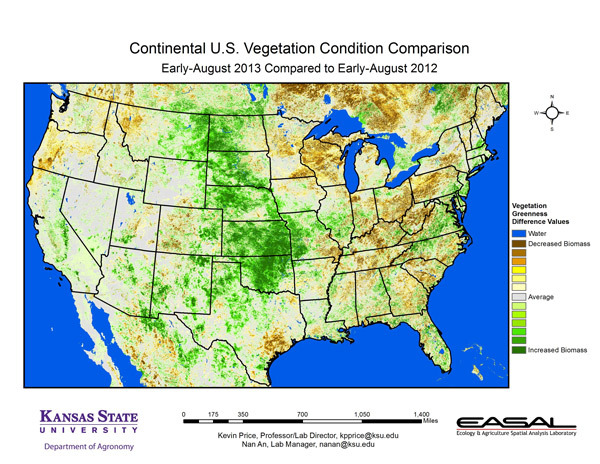 The U.S. comparison to last year at this time for the period July 30 – August 12 from K-State’s Ecology and Agriculture Spatial Analysis Laboratory shows that greatest increase in biomass production is in the Central and Northern Plains. Moderate temperatures have provided a more favorable growing environment, even in areas where precipitation has been limited. Delays in Spring plant, and continued cooler-than-normal temperatures have limited plant development in Wisconsin and the Central Ohio River Valley. Figure 9. 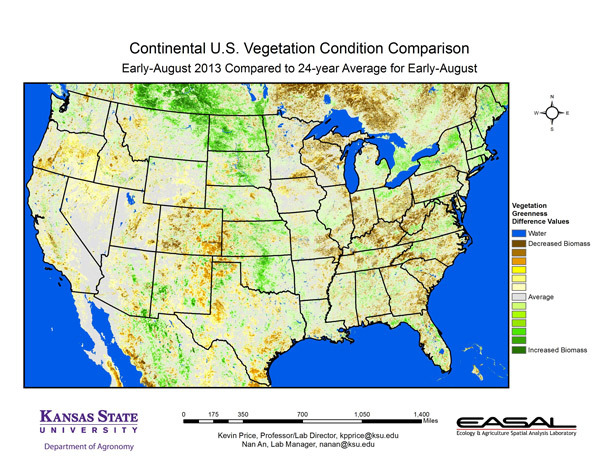 The U.S. comparison to the 24-year average for the period July 30 – August 12 from K-State’s Ecology and Agriculture Spatial Analysis Laboratory shows that much of the contiguous U.S. has close to normal productivity. Drought continues to limit production in parts of southeastern Colorado, eastern New Mexico, and central Oregon. In the East, impacts from excess spring moisture continue to be seen.